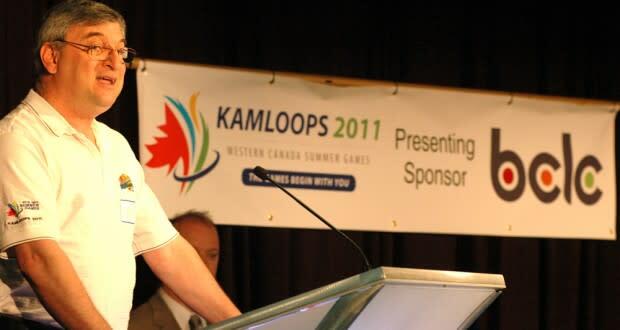 Henry Pejril speaks during the Kamloops 2011 Western Canada Summer Games, of which he was president. Pejril and John Hatchett of Sun Peaks have been named recipients of B.C. Community Achievement Awards. An independent committee selects the recipients of the British Columbia Community Achievement Awards. The 2016 selection committee members are Christopher Seguin, vice-president academic at Thompson Rivers University, Abbotsford Mayor Henry Braun, Terrace Mayor Carol Leclerc, Victoria Dobbyn of Roberts Creek and Daphne Goode of Victoria. Award winners will be recognized in a formal presentation ceremony at Government House in Victoria on May 25. Each recipient will receive a certificate and a medallion designed by B.C. artist Robert Davidson. The British Columbia Achievement Foundation is an independent foundation established and endowed by the province of B.C. to celebrate excellence in the arts, humanities, enterprise and community service. Launched in 2003, the B.C. Community Achievement Awards were the first initiative of the foundation, followed by the B.C. Creative Achievement Award for Applied Art and Design, B.C.’s National Award for Canadian Non-Fiction, the B.C. Creative Achievement Award for First Nations Art, and the B.C. Aboriginal Business Awards.